Today we simply use excerpts from an excellent article (1) on how 12 step group participation helps with Post Traumatic Stress Disorder (PTSD). Research suggests that, when treating post-traumatic stress disorder (PTSD), which is at the core of symptomatology of complex post-traumatic stress disorder (CPTSD) and co-morbid addictions, participation in a twelve-step program early in the treatment process decreases the likelihood of relapse. Quimette, Moos, and Finney (2003) found that patients with substance use disorders and PTSD who received focused treatment for PTSD immediately following treatment for the substance use disorder, along with participation in a twelve-step program during the first year of treatment, were more likely to experience long-term (five-year) remission from the substance use disorder. Because research reflects significant co-morbidity rates between PTSD and addictions, the parallel treatment of both conditions is key to resolving the disorders. Donovan, Padin-Rivera, and Kowaliw (2001) estimated the rate of substance abuse among persons with PTSD to be as high as 60-80%. Jacobson, Southwick, and Kosten (2001) studied the pathophysiology of PTSD and substance abuse, finding that both are functionally related to one another, with high rates of comorbidity. Research also suggests that, with PTSD, positive group support is the strongest predictive factor significantly related to a decrease in the severity of the PTSD symptoms (Guay, Billette, & Marchand, 2006). The constellation of similarities between complex PTSD (CPTSD) and addictions (CPTSD/A), supported by research findings, points to the necessity of integrating social support into the treatment. The twelve-step model, as an adjunctive, offers reparative experiences in the areas of regulation, attachment, brain functioning and altruistic service to others. As an adjunctive to psychotherapy, the utilization of a twelve-step program provides individual and group support for the patient. The twelve-step group provides remedial experiences for the patient that increase the likelihood of ameliorating the symptoms of both disorders. Although utilizing a twelve-step program as an adjunctive to the treatment is not a panacea, and is not appropriate for all patients, participation in the twelve-step program increases the likelihood of addressing the following confounding issues of treatment with this population: maintaining abstinence from drugs/ alcohol or other addictive behaviors, while simultaneously treating PTSD, and increasing the patient’s tolerance for secure attachments, tolerance for social support, mindfulness regarding the integrated interoceptive experiences of body and mind, and opportunities for interactive assistance with regulatory responses that mobilize activation responses that result in a safe place to which the patient can turn. Overall, the twelve-step model is an action-oriented program that offers a “safe place to go or run to” when in distress. Symptoms of PTSD are at the core of CPTSD/A; therefore, research findings for PTSD and complex trauma overlap. CPTSD includes diagnostic PTSD symptoms, as well as problems with attachment, cognition, and self-concept. Additionally, CPTSD and addictions have many symptoms in common, especially in the areas of dysregulation and attachment. 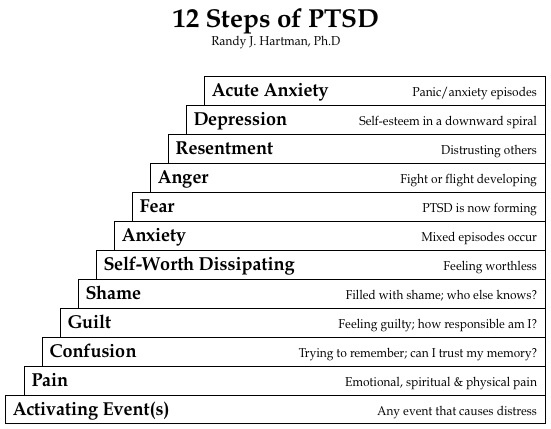 With CPTSD, not only are the classic PTSD symptoms of dysregulation of affect and state present, but also the patient typically suffers from prolonged interpersonal trauma and abuse, which results in the loss of a sense of trust, safety, self-worth, coherency, and one’s systems of meaning (Cook, Blaustein, Spinazzola, & van der Kolk, 2003). Patients with CPTSD also have disturbances in the areas of attachment, resulting in distrust, loss of faith, searching for a rescuer, social isolation, difficulty attuning to other people’s emotional states and views, disturbances on neurobiological development effecting physiologic and neuroendocrinologic responses as well as maturation of specific brain structures, hypersensitivity to physical contact, analgesia, somatization, numerous medical problems, depersonalization and derealization, poor modulation of impulses, aggressive behavior, substance abuse, eating disorders, learning difficulties, language development problems, a general sense of being ineffective in dealing with one’s own environment, believing that one is permanently damaged, difficulty describing feelings, a sense of emptiness, feelings of dread, suicidal ideation, and an inability to read internal states (Cook et al., 2003, van der Kolk, 2006; van der Kolk, Pelcovitz, Mandel, McFarlane, & Herman, 1996). I am suggesting that treating both disorders on a parallel track, while utilizing the twelve-step social context to strengthen and develop the patient’s interpersonal relationships, is key to successful treatment. Both disorders, dysregulating in origin and causing significant disturbances in overall functioning, need to be treated simultaneously, with overarching social support. If the patient builds interactive, attuned social relationships that address difficulties with dysregulated emotional responses, the patient will have longer term, readily available options when in distress. PTSD (Semple et al.,1992) and alcoholism (Adams et al., 1995) both show evidence of structural impairments in orbitofrontal activity. Schore’s (2003) work suggests that “these functional vulnerabilities reflect structural weaknesses and defects in the organization of the orbitofrontal cortex, the neurobiological regulatory structure that is centrally involved in the adjustment or correction of emotional responses” (p. 24). When treating the CPTSD/A population, if one condition is treated, while the other is ignored, the treatment often becomes chronically sabotaged. If patients seek regulatory mediation utilizing drug abuse or alcohol, a cascade of relapse events occur, interfering with the potential for self-regulatory functioning. Additionally, these relapses usually disrupt the development of potentially secure attachments. If the addiction is treated, while ignoring or dismissing the CPTSD, triggering events can lead to the fight, flight, or freeze response. After a triggering event, the patient may respond by isolating him or herself, becoming aggressive, or dissociating, to name a few responses. Again, this response may disrupt the potential for self-regulatory functioning, as well as the development of potentially secure attachments. However, if the patient has access to a broader socially supportive community of attuned others, such as a twelve-step program, during these times of distress, he or she has options for potentially reparative experiences in the areas of both regulation and attachment. Research abounds linking symptoms of dysregulation with disorganized attachment patterns (Main & Solomon, 1986, 1990), especially with CPTSD and addictions. This research has expanded our understanding of the attachment patterns of secure, insecure-avoidant, and insecure-resistant (Ainsworth, Blehar, Waters, & Wall, 1978). Bowlby (1973) looked at the link between attachment processes and dissociative psychopathology. He referred to internal working models (IWM), which are formulated as a result of care-seeking interactions with primary caregivers. The formation of multiple IWMs serves to regulate emotions and cognitions in a way that is alien to the self (Bowlby, 1973). He further described patient’s symptoms as the outcome of attachment figures that induced the child to disown personal, firsthand experiences (Bowlby, 1978, 1979). In more recent literature, this observation of Bowlby’s is now referred to as dissociation and disorganizing attachment patterns. Grotstein (1986) recognized that early-forming psychopathology results in disorders of attachment that manifest in neurobiological impairments and result in failures of self and/or interaction regulation. Schore (2003) asserts that “the functional indicators of this adaptive limitation are specifically manifest in recovery deficits of internal reparative mechanisms” (p. 24). As a result, there are deficits in coping with negative affect and deficits in adaptive responses to socioemotional stress. Van der Kolk and Fisler (1994) recognize this inability to regulate intense feelings as the most far-reaching effect of early trauma. The two can barely be separated, as it is currently understood that both regulation responses and attachment patterns can either complement one another in treatment or implicate one another. I believe that, along with the formation of a therapeutically developed secure attachment, which assists with regulatory responses for the patient, the twelve-step experience may offer an additional socially-driven support system, in which exposure to secure attachments and self and other interactive regulatory experiences can be developed. Liotti’s ( 2006) theory suggests the need in psychotherapy for a phase-oriented process focused primarily on achieving attachment security and, secondarily, on the trauma work. Along with others, I am suggesting that achieving a secure therapeutic relationship, as well as developing other significant interpersonal relationships in treatment, is of primary importance (Gold et al., 2001). Further, the exposure to potentially long-term interactive experiences with members of their twelve-step group can provide remarkable reparative experiences. For example, an Alcoholic Anonymous (A.A.) survey taken in 2004 found that 36% of the members were sober over a ten-year period, 70% had a sponsor (a person who shares their experiences and provides strength) within 90 days of attending their first meeting, and meeting attendance averaged over two meetings per week. Additionally, 8% of the members indicated that they were referred to A.A. by a healthcare professional, 31% were referred through a treatment facility (Alcoholics Anonymous, 2004). The twelve-step model, although primarily for the treatment of the addictive disorder, offers regulating and mediating reparative experiences that address CPTSD as well. Not only does the twelve-step program assist the patient in mediating experiences, but it also assists in developing and modeling secure attachments that not only help the patient, but help others at the same time. This altruistic basic tenet of the twelve-step program, helping others, is grounded in an action-oriented approach, accomplished through interactive, action-oriented directives between members. When members in the twelve-step program are in distress, they are encouraged by other members to reach out for help. Whether the member is in a CPTSD-triggered response or an addiction triggered response, he or she has the option to interact with others in order to mediate painful affective/state experiences, using the tools of the twelve-step program. The members are encouraged by other members, and the program’s literature, to share their distress with each other in order to help themselves, as well as each other. Members are encouraged to reach out and share with others through going to group meetings, making service commitments at the group meetings, making telephone calls to other suffering members, actively helping others in distress, having a relationship with a sponsor, doing writing assignments, and learning about and working the twelve steps, twelve traditions, and twelve concepts (Appendix). Overall, in the twelve-step program, the act of sharing each other’s experiences, strength, and hope is what unifies the members. Helping one another is the primary tenet and is believed to be paramount to recovery (Alcoholics Anonymous, 2005).